You can be assured you will receive 100% of our effort and expertise from your first consultation to the very last. We accept WorkCover, TAC patients and we are Preferred Providers for Medibank Private and BUPA. 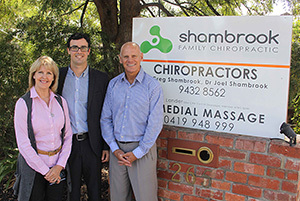 The Shambrook Chiropractic clinic is located in Greensborough on the border of St Helena & Eltham. We care for patients from all over Melbourne & country areas. Our chiropractic clinic opened in 1999 after the Shambrooks returned to Australia from practising in Argentina. We have a very relaxed and friendly clinic that caters for all patients. Our office is all on one level for easy access for strollers and wheelchairs. Reputation and continued business relies on word of mouth referrals from our satisfied clients. That is why you can be assured you will receive 100% of our effort and expertise from your first consultation to the very last. You will notice that Dr Greg and Dr Joel are very thorough and efficient, giving you the best of their knowledge and understanding along with gentle Chiropractic care. Call Shambrook Chiropractic today. Download the new patient form and fill it out at home at your convenience. Don’t forget to bring it with you to your first appointment. Want to know ways to optimise your health and why chiropractic care is so important? Come and attend our next Creating Health Workshop. Get the best for your back so you can get back to your best!